Next up in this series on Rives Quality Meats is this BBQ variety. The last two reviews of their Regular and Chicago Style showed that Rives' wins high marks through a great tasting meat flavor. Rives Quality Meats is a butcher shop located in the small town of Rives Junction, MI. They serve the local hunters and farmers by turning wild game and livestock into steaks, chops, burger, and jerky. It was started in 1973 by Tom Hosler, and over the years expanded its offerings to become a small grocery store and delicatessen. Beef jerky was one of their first retail products. It was only a year ago that Rives Quality Meats launched a website. Prior to that they remained largely unknown from jerky snackers nationwide, being tucked away in rural Michigan. The first thing I taste off the surface of these pieces is a smokiness, followed by a light sweetness. That sweetness becomes more like a BBQ sauce. As I start chewing, I get a strong meat flavor, plus a bit of saltiness. I can also taste some BBQ sauce in the meat itself. There definitely is a BBQ sauce flavor to this jerky, in a significant amount, and it tastes like BBQ sauce, as opposed to BBQ seasoning. It has a good deal of sweetness, a noticeable bit of garlic, a slight bit of tanginess. It's not spicy as Rives' website claims. It's mostly a mild, sweet BBQ flavor. I want to say it's comparable to KC Masterpiece Regular. The natural meat flavors, however, still seem to be the dominant taste of this jerky as with the other varieties I reviewed. It's got a mellow, smooth flavor that reminds me why I love eating meat. I can see small bits of fat in between the grains of this meat, and I think that adds some touches to the overall meat flavor. I wouldn't call this a "fatty" meat flavor by any means. It's clearly a meat flavor I'm tasting, but with some highlights of fatty flavor. There's also a bit of smokiness in the meat. The BBQ flavor mixes into the meat as I chew, and creates a sense of eating a grilled steak slathered in BBQ sauce. There's also a noticeable touch of black pepper that remains in my mouth as an aftertaste. Overall, what you're going to taste in this is an immediate smoky flavor off the surface, followed quickly by a sweet BBQ sauce flavor. In the chewing, the natural meat flavors are going to burst on to the scene and become the primary flavor from that point on. The BBQ flavor will mix into that meat flavor. You'll notice a slight spiciness from the black pepper, and taste hints of garlic too. These are thick strips of whole meat, in lengths of about 2-5 inches, and widths of about 1/2 to 1 inch. It's a semi-moist jerky inside the meat, however the surface is very wet. They crack apart quite easily with little bending. The strips are mostly cut against the grain, so that biting off a piece is very easy. Chewing seems easy as well. The chewing texture starts out feeling like a stiff piece of meat, but chews down into a meaty consistency quicky in about 5-10 seconds. I don't get any rubbery-resistance at all. It doesn't feel mushy or gummy, it mostly feels like eating a steak cooked medium-well, having a fibrous quality. Some of these strips tend to take on a crumbly texture, perhaps those a bit drier than others. When I spoke to someone at Rives Quality Meats, they said they're jerky is very soft and moist. I might agree on it being moist, but not very moist, and not very soft. It certainly is easy to eat and chew, and not tough or dry by any means. In terms of clean eating, these are not. My fingers pick up a lot of moisture handling these pieces. Each time I pick up a piece, I have to lick my fingers and wipe them on my jeans. But they don't drop any fragments of meat as I bite chunks off. I don't really find any significant chunks of fat, but I do find some small streaks of marbilization in between the grains. Otherwise, I don't find any tendon, gristle, and I don't find any chewy sinews in the meat. For general jerky snacking purposes, at the $1.16 price per ounce, it's an excellent value. This BBQ variety presents so much snackability with its excellent meat flavors and its sweet, tangy BBQ sauce, easy eating, and thick chunks of meat, that a price this low is going to yield a lot of snacking return for your dollar. Keep in mind I bought this at a special price. As a BBQ variety of beef jerky, at the same $1.16 price per ounce, it's also an excellent value. I'm getting some good BBQ sauce flavor, and not just BBQ seasoning like you'd find on potato chips. There's a lot of sweet, garlic, and tangy flavors, including plenty of wet sticky sauce on the surface, just like grabbing a piece of sauced-slathered steak with your bare hands. I hate to sound like a shill for Rives Quality Meats, but this BBQ variety wins big mostly for its great natural meat flavors. The BBQ flavor is also good, but it's not the primary flavor, it's just yet another way of framing the wonderful taste of beef. But that's not to say the BBQ flavor is not well represented here. It's very much noticeable, and this jerky does a good job of backing up its advertised flavor. If you're a big fan of BBQ flavored jerky, you'll get a good deal of that flavor here. The meat consistency in this is excellent, being almost all meat except for the tiny flecks of fat in between the grains that I think enhance the overall meat flavor. This jerky has some moistness to it, and it's easy to chew. The chewing texture is pretty good, feeling just like a steak. And the thick strips of meat provide a lot of snacking anticipation as well. Even the way Rives' cuts this meat against the grain makes it easy to bite off. I wrote this review with a Pipeline Porter from Kona Brewing Co. I wanted to place an order of 1lb of jerkey and some beef stix. Shipping was $27 to CA!! more than the price of the jerky! Anyone know what kind or brand are the gas station jerkys? the one with chili flakes that they charge $3-4 for a peice.. 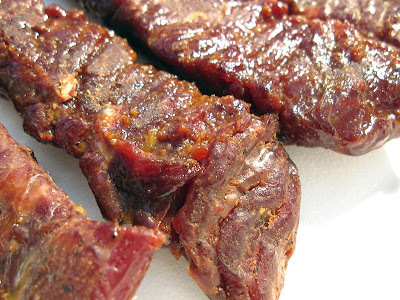 I have ordered jerky and stix from Rives Meat Store and I am extremley pleased with the quality. All shipping charges include icepacks & insulated packaging. Give them a call, they work with you on a personal level and are willing to requote shipping based on the "best rate" possible. The taste is worth the effort. I bought a few bags of Rives, and while the packaging was great, the shipping price was ridiculous. I would never have agreed to pay this much for shipping were it not for the stellar review. Since I wasn't going to eat the jerky right away, I kept it in the refrigerator until I was ready to eat. I found that once the jerky had returned to room temperature that quite a bit of the outside flavoring stuck to the bag. The jerky was kind of "wet" and this was a turnoff. As for the taste, I think it's good, but not great. I'm not as enthusiastic about this jerky as Steve is, and I won't be ordering it again. However, I would encourage others to try it, as it may just be personal taste. I just don't think it compares to others like Couple O' Jerks, Datil Daddy's, Ed's Roadhouse, Jerky Guy. I did call and they shipped to Ohio for $5. I really liked their bbq jerky. I like a thicker jerky then the flat thin jerky. 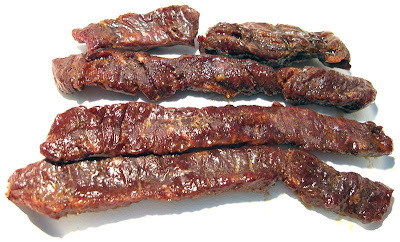 This jerky comes in thick pieces. This has turned out to be one of my top 3 favorite jerkys. The packaging is over the top. It comes vacuum sealed so the can do away with the insulation and cold packs and reduce the cost of shipping. All of that packaging has no affect on something that is vacuum sealed. The Hawaiian turkey jerky is awesome!